Fish oil plus borage seed oil for healthy skin, joints, and cognition. 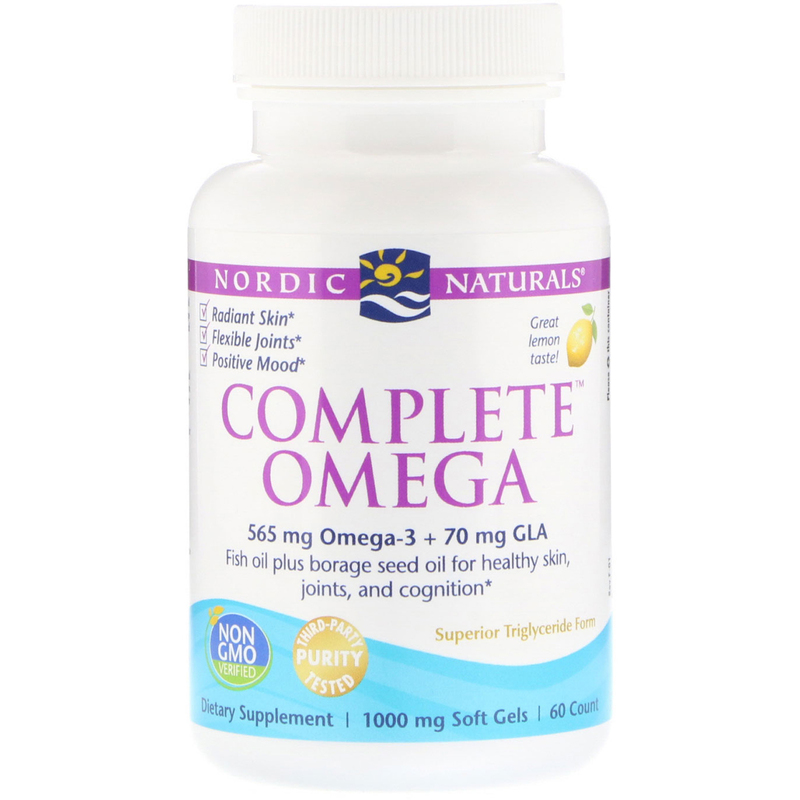 Complete Omega combines omega-3s EPA and DHA from fish oil with the unique omega-6 gamma-linolenic acid (GLA) from borage seed oil. This blend helps nourish skin, promotes a healthy mood, and supports cognitive function and joint health. Borage (Borago officinalis) is a bee-friendly flowering plant with beautiful star-shaped blooms - one of nature's richest sources of GLA. 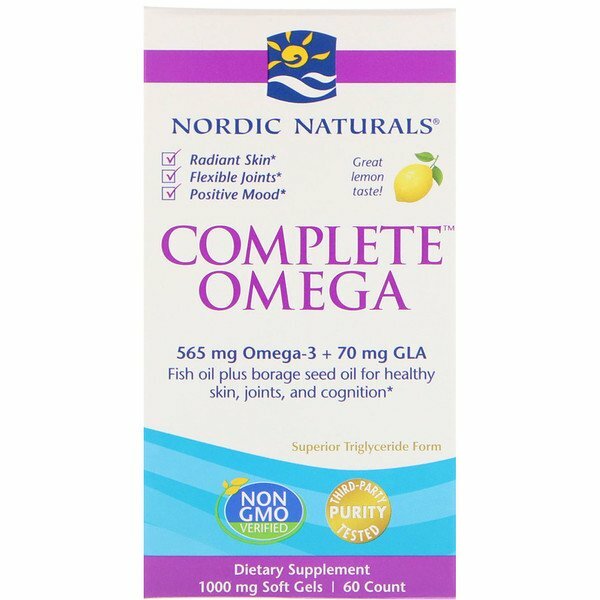 Every batch of Nordic Naturals fish oils is tested by a third-party certified lab environmental toxins, including heavy metals. All fish oils are in the triglyceride form and surpass the strictest international standards for purity and freshness. Radiant Skin: Supports normal skin cell maintenance and repair. Joint Health: Promotes joint mobility and flexibility. 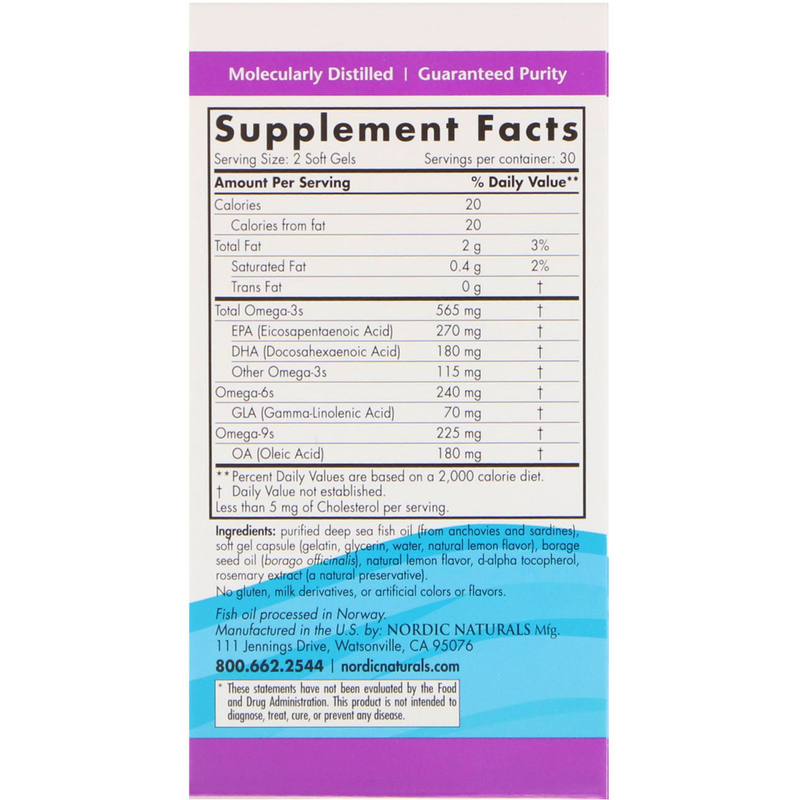 Brain Health & Mood: Supports optimal brain function and a healthy mood. All Nordic Naturals fish oils are in triglyceride form for superior absorption. Purified deep sea fish oil (from anchovies and sardines), soft gel capsule (gelatin, glycerin, water, natural lemon flavor), borage seed oil (borago officinalis), natural lemon flavor, d-alpha tocopherol, rosemary extract (a natural preservative). Consult with your physician before using this product if you are allergic to iodine, use blood thinners.